Firefighter stopped a fire in a wall before it became a serious house fire Wednesday afternoon. Arlington Heights police and firefighter/paramedics responded about 2:00 p.m. Wednesday to a report of a house fire in the 200 block of North Haddow Avenue. Police and firefighters arrived to find light smoke showing and pulled a hose line into the basement and another in the front door. The fire was somewhere near the basement ceiling and front wall of the house. Fire fighters quickly extinguished the fire and started to inspect the house for extension of the fire. The front wall of the house was hot, so firefighters pulled off siding and pulled at fascia to make sure the fire had not extended up the outside of the wall. Firefighters used a thermal imaging camera to search for any hidden fire in the house. A fair amount of residual smoke continued to ventilate from the house and light smoke was reported in the attic. No extension of fire was discovered in any other part of the home. No injuries reported. Fire officials and building officials are investigating. Firefighters Elk Grove Village, Glenview, Lake Zurich, Rolling Meadows and others assisted Arlington Heights. 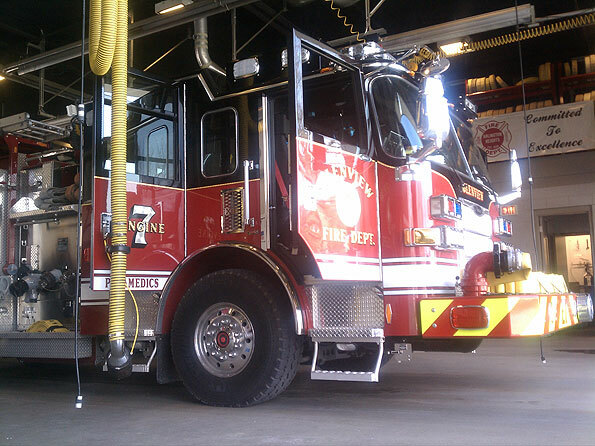 Glenview Fire Engine 7 stands by for a change of quarters for Arlington Heights at Fire Station 2 — protecting Arlington Heights while other firefighters were at work on Haddow Avenue. 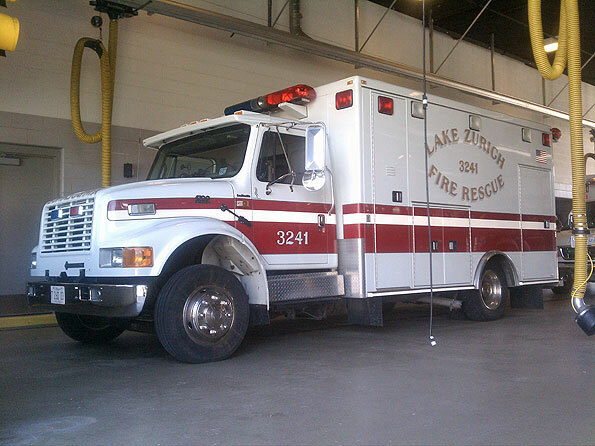 Lake Zurich Fire Rescue ambulance stands by for a change of quarters for Arlington Heights at Fire Station 2 — protecting Arlington Heights while other firefighter/paramedics were at work on Haddow Avenue.